Due to the tragic accident and our high regard for him, we are dedicating this year's race to Philip's memory - The Saint Sebastian 100 Philip Brown Memorial Race. The 2018 Number 1 running bib will be reserved in his honor, and Philip's wife, Mary, will keep the travelling trophy that Philip was so proud of. In return, Mary had a special traveling trophy designed in honor of Philip, which was won by Chuck Pinto at the race in November 2017. The trophy will be returned at the race for the next winner to take home for 1 year. 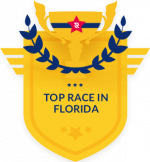 The Saint Sebastian 100 is located in the St. Sebastian Preserve State Park, Sebastian/Fellsmere, Florida. The race distances will be 50 K, 50 and 100 miles with a 32 hour cutoff, see about the race for all details.